The premise of hunger games is awesome - because its' story uniquely appeals to both guys and girls, just like Harry Potter. I have fervently read all 3 of the hunger games series because YOU JUST WANNA KNOW WHETHER THE CAPITOL WINS OR OUR AWESOME BOW-GIRL WINS. "I hope that bird gets into my line of sight soon.. BECAUSE MY NOSE ITCHES"
Synopsis: This movie is a classic portrayal of human rights in a dystopian era. Our Katniss, after winning her first hunger games with her "love interest" Peeta, finally gets to enjoy her victory... or will she? Cannot be right, if not how to have Part II? Catching fire is aptly named - wai our mockingjay catch fire? What did she do to land herself into hot soup? At the end of the first movie, we can see that President Snow already buay song with her. What kind of things will President Snow plan to ensure the demise of this symbol that is causing the uprising in the different districts? It's stupid, I know, that his efforts make me so vexed. All I wanted was to keep Peeta alive, and I couldn't and Finnick could, and I should be nothing but grateful. And I am. But I am also furious because it means I will never stop owing Finnick Odair. Ever. So how can I kill him in his sleep?" But this movie? The director, Francis Lawrence, made a faithful adaptation to the book, squeezing in every little details from the book whenever he can. The first half of the movie explains why Katniss/Catnip is thrown into the games again. I have read some reviews that people find the first hour of the movie totally boring. Uhhh, so you just want to watch the game itself without knowing waiii is she back into the arena? Might as well just go watch pro-wrestling? Right? The plot before the game is interesting as we see how the story develops and thickens with our mockingjay fighting President Snow+ Gamemaker. 1 versus 2. You can feel the anguish and the helplessness when she witness all the things the evil people at the Capitol do to her loved ones. All these pent up anger will finally culminate at the Arena when she does something to ruin the game.. again(?). Superbly awesome, that scene. And for girls - Gale (Liam Hemsworth) is super handsome. I can't decide who is more handsome though, Liam or Chris Hemsworth (THOR)? 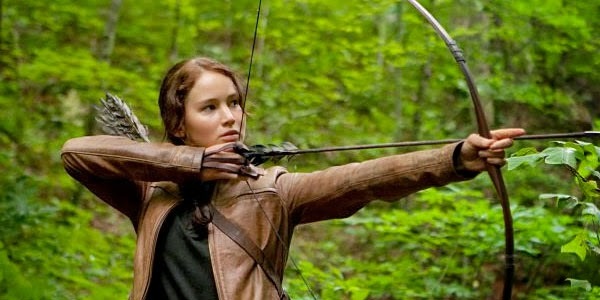 The same director is going to direct the last and final TWO parts of the Hunger Games! Looks like this is the norm for the movie industry isn't it - split the trilogy into two parts, earn more money. But as long as the screenplay and directing remains as good as this, I seriously don't mind seeing more Katniss and her bow.